Stunt pilot Bryan Jensen was killed in fiery crash during an air show on Saturday after his plane appeared unable to get out of a downward spiral and plummeted nose-first into the ground, witnesses and authorities said. A high performance aerobatic biplane spiraled downward into the ground during the Kansas City Air Show Saturday. According to Bryan Jensen’s website he was a professional pilot for Delta Air Lines who has flown aerobatics for 15 years. Bryan has since flown numerous types of large and small aircraft including the Convair 580, DC9, MD80, Boeing 727, Airbus 320, and Boeing 747-400. He most recently was flying the Boeing 747 for Delta. Officials have not declared the cause of the crash, but pilots speculate that Jensen may have experienced G-Lock of a G-force induced loss of consciousness. 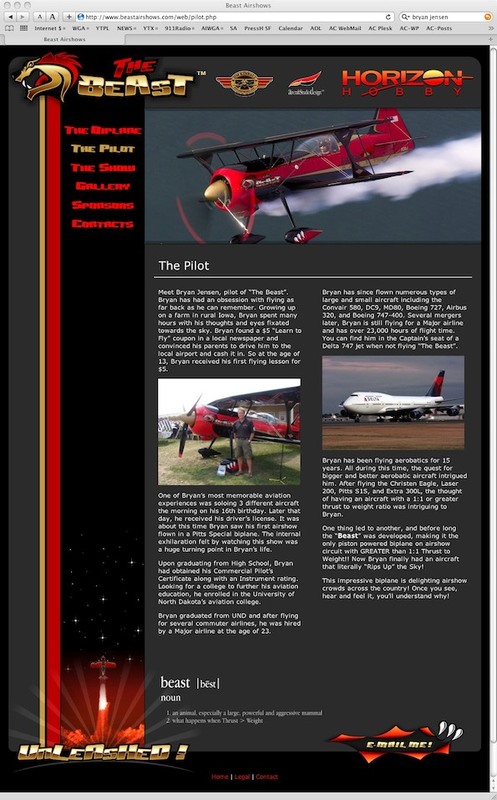 According to Bryan Jensen’s website he had just returned from “four great days at Oshkosh. Jensen was looking forward to flying at the KC Aviation Expo on August 20-21, and at the “Thunder In The Valley” airshow in Waterloo, Iowa the following week. Bryan Jensen web page on August 21, 2011.